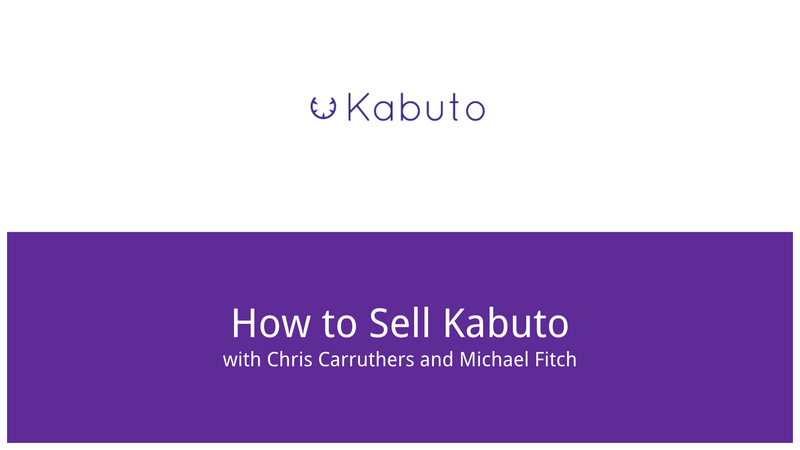 We’ve built you this scrumptious step-by-step guide to make it dead simple for you to start selling Kabuto. We’ll give you some ideas on how you can set pricing, get the word out, and show you some examples of how other techs are selling. Rebranding your Kabuto account with your own logo helps your customers know its you when they get notifications, improving your brand recognition and customer loyalty. 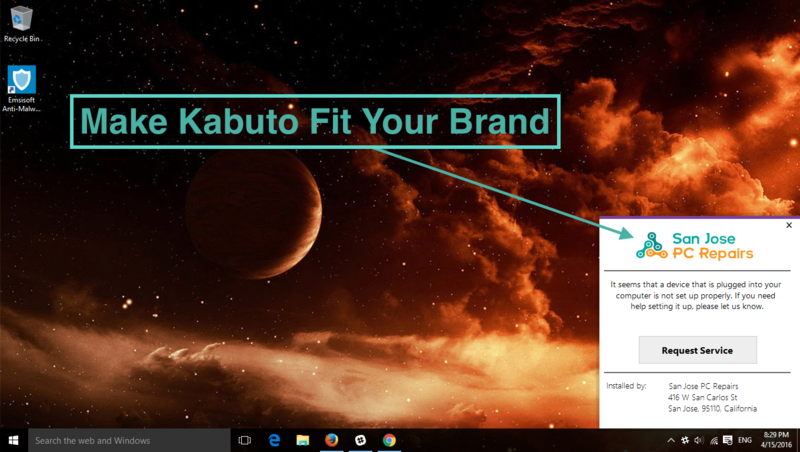 On your Kabuto dashboard, simply go to ‘Settings’ > ‘Branding’ and you will see options for uploading a Branding Logo (recommended size 500x100) and Branding Icon (recommended size 48x48). With Kabuto’s upgrades, you can instantly offer valuable managed services to your customers and charge a monthly fee. In this step, determine which upgrades you think are the right fit for your clients. 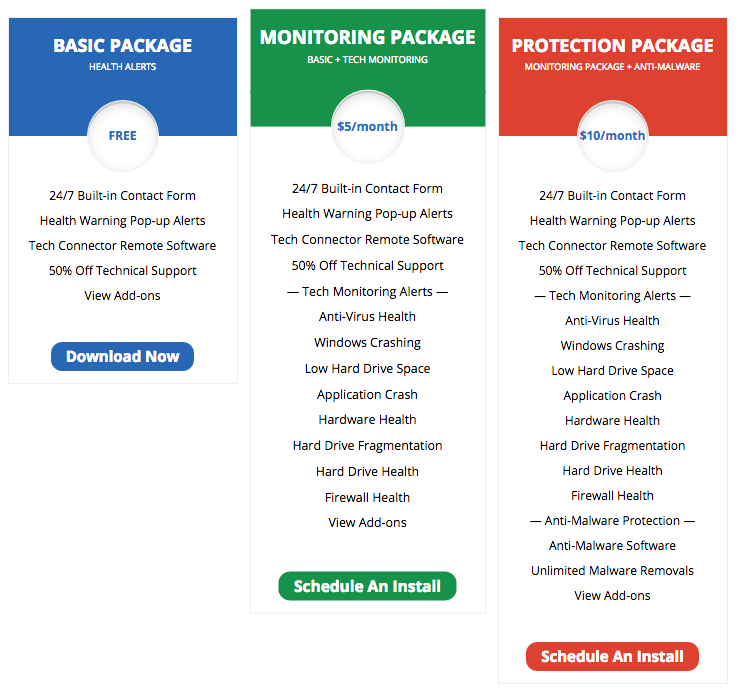 The Kabuto Managed Antivirus Upgrade costs $2.00/month per device and we’re seeing techs charge around $10/month per device for a Managed Antivirus subscription. Provide great value to your clients and get even better value for your business. We’ve recently partnered with the award winning Anti-malware solution Emsisoft to provide a Managed Antivirus solution for Kabuto. With Kabuto’s plug and play monitoring functionality, you can quickly and easily keep an eye out for problems with client machines, and proactively help them before things get too nasty. The Kabuto Monitoring Upgrade costs $0.50/month per device and techs typically charge around $5/month per device for a Monitoring subscription. Clients really love it because they know they have a direct line to a tech they can trust. Includes the Windows App for communicating with a technician at any time, and desktop notifications to customer when an issue is detected. 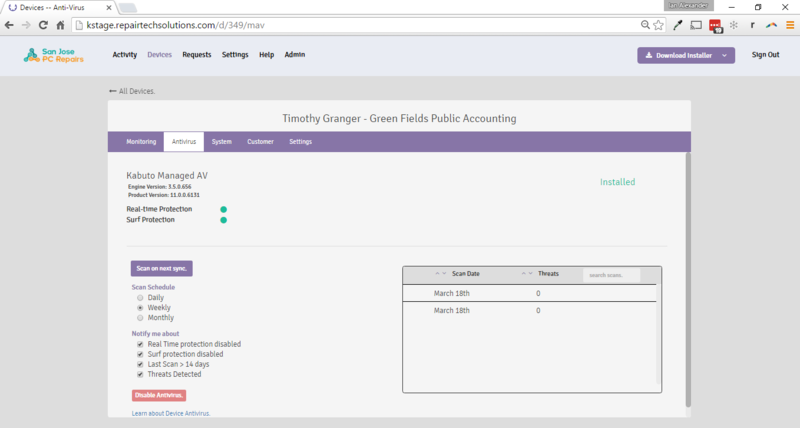 You can provide this for free to customers, and try to upsell them on the Monitoring Package. 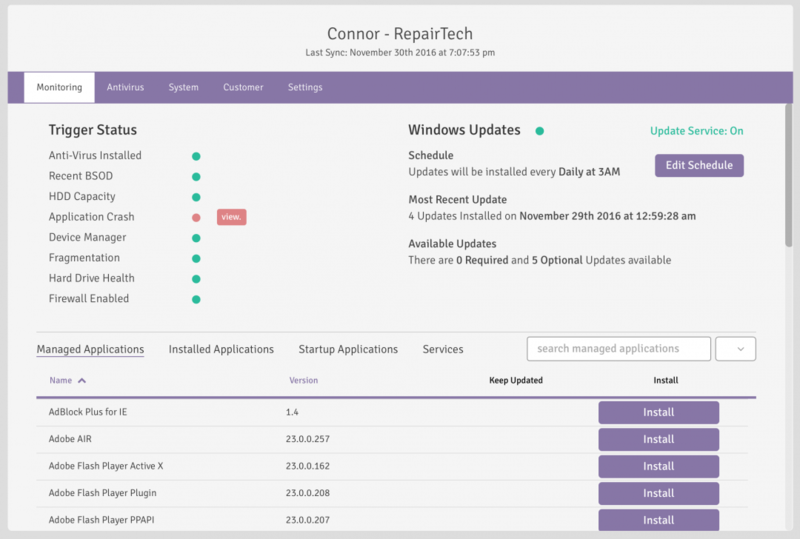 Includes the Basic Package features, plus Tech Monitoring so the technician can proactively see the issues as they occur, rather than waiting for the customer to contact them. Shops typically offer the Monitoring Package for $5/month. 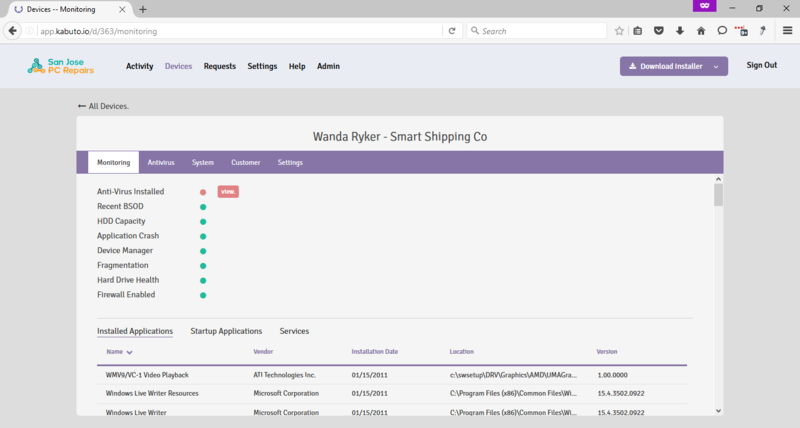 Includes Basic and Monitoring features, plus Emsisoft Anti-Malware, which you can manage from the Kabuto dashboard. Your customers will have peace of mind that you’re providing the best AV solution on the market, and that they’re always secure. We recommend you sell this for at least $10/month. See how Kabuto can help you grow your business with this easy to use ROI Calculator. Numbers based on feedback from existing customers. After customers receive service at your shop, a great way to get them to try Kabuto is to install it as a free add-on before they leave. Customers like knowing they can get in touch with you at a moment’s notice if anything else comes up. We have a new section on our website where you can download marketing materials to help you sell Kabuto. One of our Kabuto users over at Connect 2 Geek has made this great overview video for teaching customers about the benefits of using Kabuto. Take a look and get some ideas for how you can incorporate something similar for your business. Also, the gents over at Hart’s PC Repair call Kabuto ‘Tech-Connect’ and do a great job of displaying their offer to customers. See their Sales Page. Chris Carruthers and Michael Fitch talk shop and share how techs are selling Kabuto to their clients.